Plodda Falls Lodge is in a truly unique location. Two miles further on from the Victorian Conservation village of Tomich, and along a mile of forestry track Plodda Falls Lodge is set in seclusion, close to the spectacular Plodda Falls, amidst some of the most stunning scenery in the Highlands. The Lodge and location are unsurpassed. 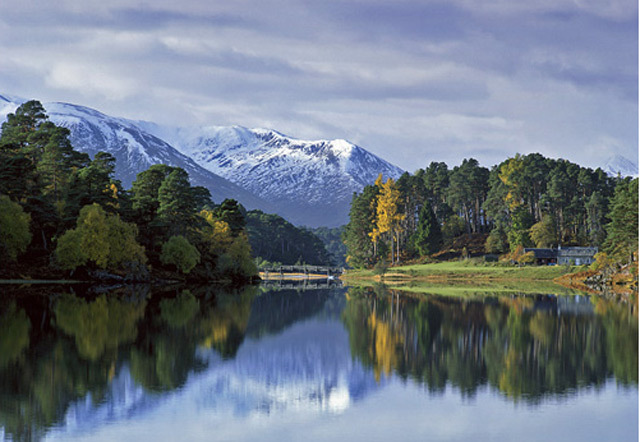 You can walk in total peace, uninterrupted by roads, in any direction, through forests, glens and mountains, as far as thirty miles of unspoilt wilderness, through Glen Affric and toward the West Coast of Scotland. 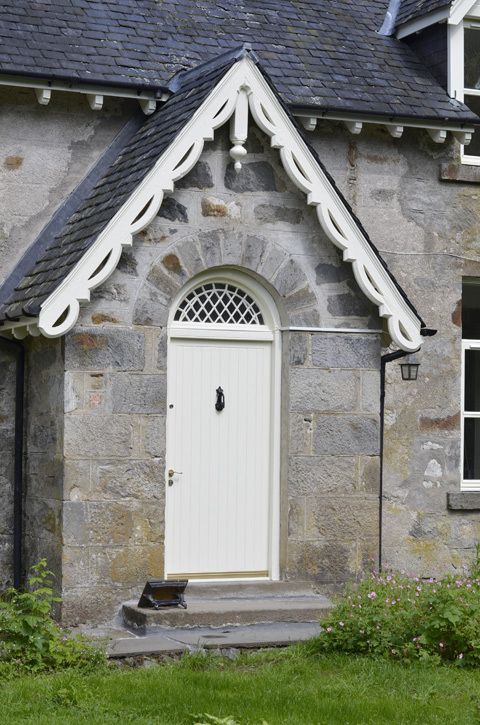 Plodda Falls Lodge once formed part of the historic Guisachan Estate and the model village of Tomich, that was created by the innovative Victorian Lord Tweedmouth. He also built Plodda Falls Lodge as the laundry to the now ruinious main Guisachan House. With high ceilings, massive douglas fir beams and magnificent features it truly reflects this era in the Highlands. The wonderful reception rooms with window seats overlooking the beautiful cottage garden are part of making it the perfect place to relax. The old estate was planted with specimen trees and frequented by many of the rich, famous and royalty, including Winston Churchill who it is believed learnt to drive on the estate. At Plodda Falls Lodge, nature and wildlife are abundant with majestic golden eagles, buzzards, osprey, red and roe deer, red squirrels, badgers, otters, pine martin and more, making it a true haven for animal and nature lovers and those wishing to stay away from it all. 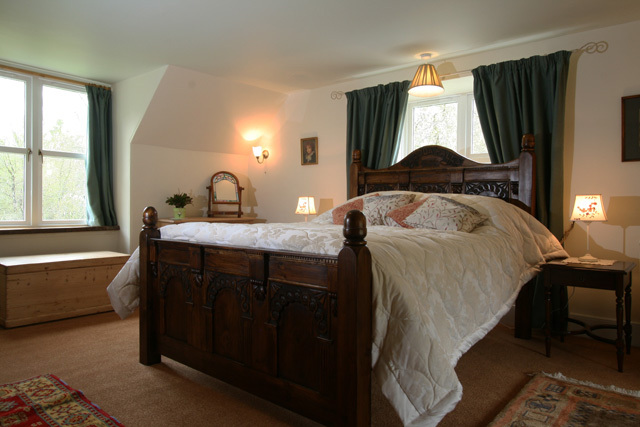 In Tomich there is a small seasonal country house hotel with bar and dining, and further choice is available at Beauly together with a wide range of shops and other places of interest including the ruins of Beauly Priory that date back to 1230AD. Drumnadrochit, 16 miles away and on the shores of Loch Ness, also offers a good choice of dining, tourist information, shops and places of interest including 13th century Urquhart Castle and Divach Falls with superb views across Loch Ness. For those wishing to travel further afield, the West Coast of Scotland, Isle of Skye and Glen Coe, to name but a few, make a wonderful day out. Either river or loch fishing for wild brown trout or salmon can also be organised for you locally as can pony trekking and golf. The fantastic Glens of Affric, Cannich and Strathfarrar are all close by and offer superb sightseeing, nature watching, walking or mountain climbing. Lounge with internet connection, radio, iPod dock, window seats and views to the cottage garden. 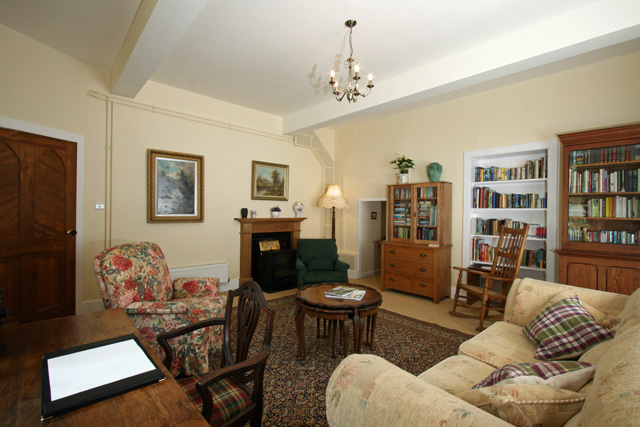 Living/dining room with multi fuel stove, Freesat TV, DVD, CD, window seats with views to the cottage garden. Kitchen, double electric oven and hob, microwave, fridge, freezer, dishwasher, washer/dryer. Fully tiled shower room, wc, whb. 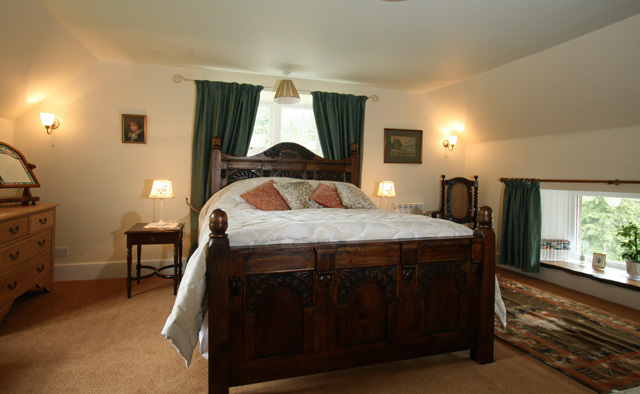 Master bedroom with superb hand carved bed and views over the cottage garden. 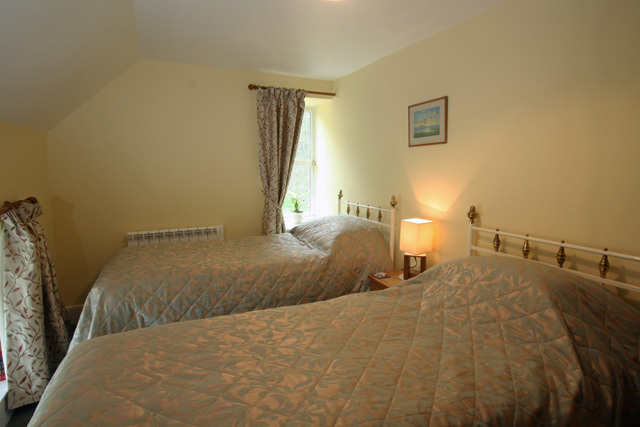 Double/Twin bedroom with zip and link bed, views over the cottage garden, please specify your requirent at the time of booking. Twin bedroom with views over garden. Bathroom, bath with traditional shower over, wc, whb. Electricity and heating cost allowance of £35.00 per week, extra charged at cost. Biomass heating system for extreme weather conditions. Initial supply of kindling and coal for the multi fuel stove. 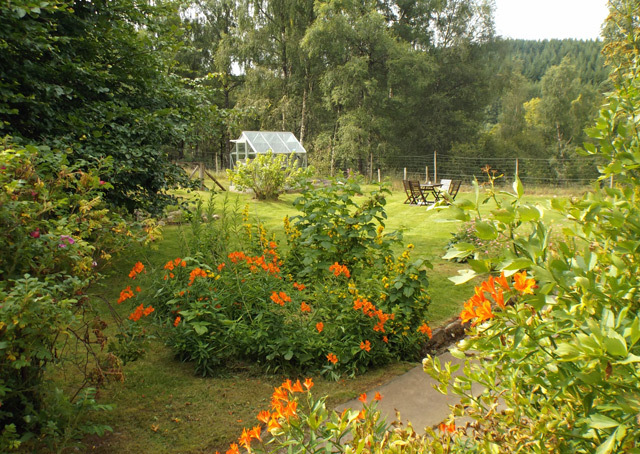 Beautiful enclosed cottage garden, with garden furniture and barbecue. Selection of DVDs, CDs, books, games. Honesty phone for local calls. WiFi internet access via satellite, bring your own laptop. Off track parking for two/three cars. 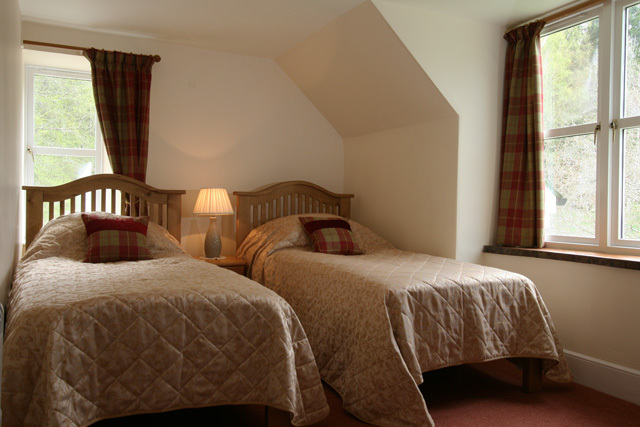 Two pets are welcome at Plodda Falls Lodge. 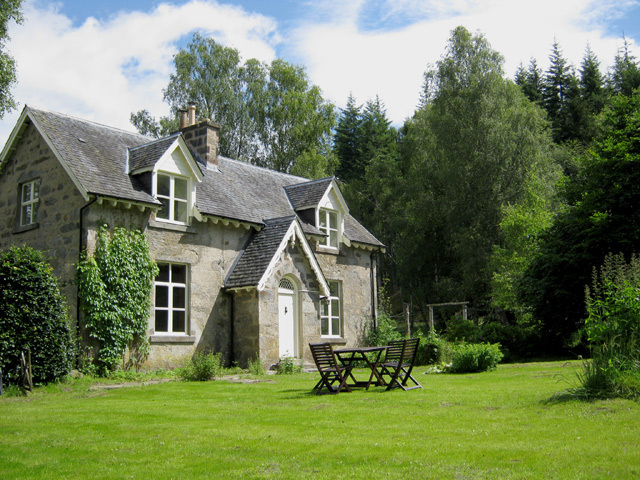 Plodda Falls Lodge is in a wonderful location which is accessed only by an unmade forestry track; this makes it unsuitable for cars with low suspension or sports styling. A 4 x 4 type of vehicle is recommended, however normal cars can access the Lodge as long as care and time is taken. If you would like any more detailed information please discuss this at the time of booking. 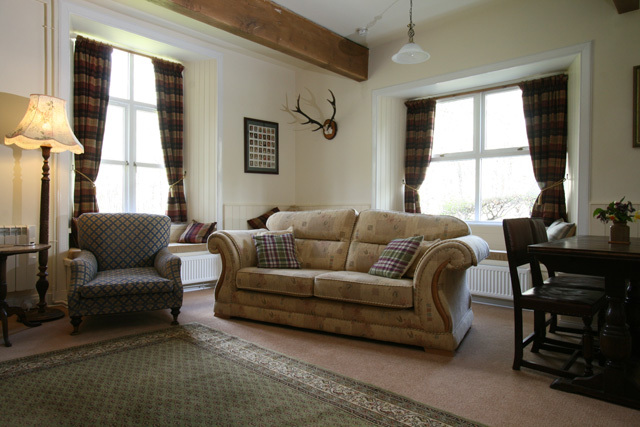 Traditional Highland Lodge in a stunning and rural location. Out of the door walking that is uninterrupted by roads or traffic. A unique area for nature, wildlife and flora and fauna enthusiasts. We have just spent 2 weeks at Plodda Lodge and it was just paradise! The house is comfortable and welcoming, full of fascinating books and interesting artefacts. The owner Jenny is a genuine nice person who will try her very best to make your stay unforgettable. The location of the house is unique, surrounded by forest and wildlife. The garden is beautiful with numerous bird feeders and a lot of greedy birds to watch from the bay windows. There is also a wonderful vegetable patch, where you can go and pick some fresh vegetables or fruit in season every day! Walking in the woods around the house, we found an abundance of wild berries and went foraging for chanterelles mushrooms, which are a real delicacy.We found a lot of them on more than one occasion and it was a privilege to come back home to cook them right after picking. The glens in the area are majestic and serene. We loved Glen Affric and Glen Cannich but Glen Strathfarrar was beyond beautiful...a true gem! Plodda lodge is a special place..be prepared, you will be very sad when you leave! 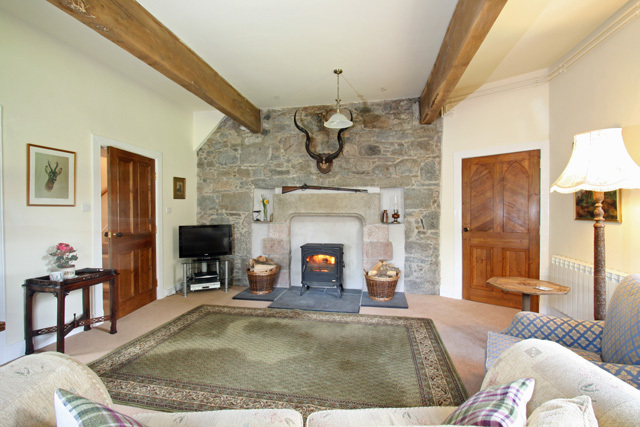 Definitely in the wilderness, away from it all - delightful and very well appointed property. Friendly hosts and some excellent walks in pretty pristine forest on your doorstep. Great for the dog! Plodda Falls Lodge is a beautiful, unique cottage in the woods. A haven for birds and wild life , we loved our stay there. Jenny greeted us on our arrival with fresh eggs and delightful lemon drizzle cake. The cottage is a true delight. 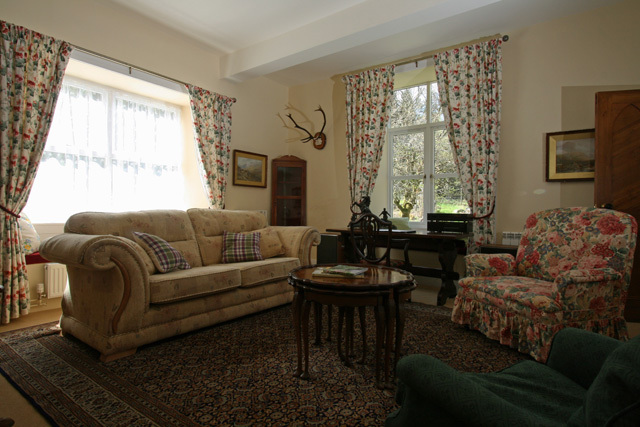 Elegantly furnished and a cosy home from home and made possible by Jenny's eye for detail and caring, friendly personality. Our dogs Lilly and Winston loved the secure garden and Forrest walks. Thank you Jenny for a perfect holiday retreat and for making us so welcome. 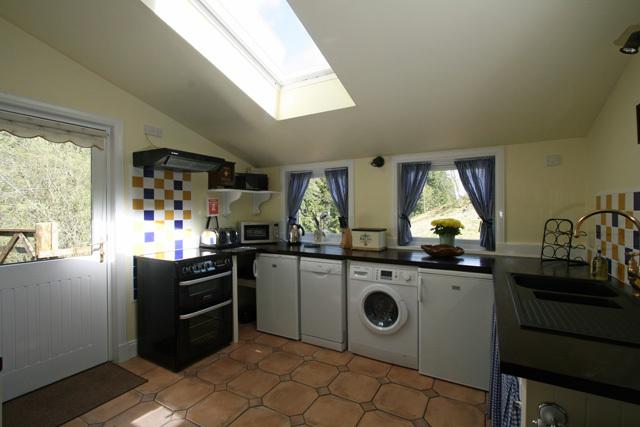 A wonderful, well equipped cottage in a beautiful location. Jenny was a great host and makes a fabulous cake-thanks Jenny! Sorry we didn't get completely snowed in - a week was too short. Our hairy companion was also made to feel very welcome and the enclosed garden and surrounding walks were just ideal. Would highly recommend. What a wonderful cottage. It has everything you need and the location is remote which suited us. The log burner is a treat on chilly nights and the bed is so comfortable you will never want to leave. The owner Jenny's own house is about a mile down the road - close if you need help with something but never obtrusive. The bird table has lots of visitors and you can walk/bike straight from your front door. Booked again to visit in October.